Since Helen Hunt hasn't been super busy in front of the camera, the star of The Sessions, Pay It Forward and As Good As It Gets has decided to get back behind the camera for a new comedy called Ride. The actress also stars in the film she wrote about a woman who follows her college dropout son (Brenton Thwaites of The Giver and The Signal) to Los Angeles as he pursues a life of surfing. Of course, this ends up being a life-changing experience for her as well. It seems like it's trying too hard to be a typical indie story self-discovery, but kudos to Hunt for taking the initiative to write and direct a film for herself to star. 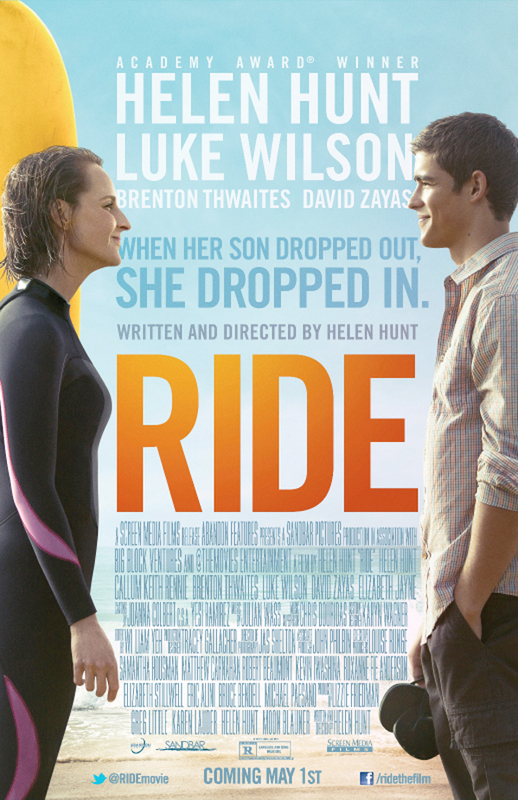 Ride is written and directed by Helen Hunt (director of Then She Found Me, star of The Sessions). When an editor from The New Yorker (Hunt) follows her son (Brenton Thwaites) to LA after he drops out of college to surf and find himself, she ends up being the one thrust into a sea change of self-discovery. Once she finds herself sucked in by the city and the surf, she befriends a limo driver (David Zayas), rediscovers her sexuality with a younger surf instructor (Luke Wilson), and begins to heal her fractured relationship with her son and herself. Screen Media Films releases the comedy on VOD and in limited theaters on May 1st. Glad Zayas got a mention on the poster. He is cool.